It is an illustrated adventure story told from the first person POV. A Web Serial updated d̶a̶i̶l̶y̶ twice weekly (Mondays and Fridays). Only on NewTribeZ! Think of it as something like Robinson Crusoe crossed with The Little Mermaid. 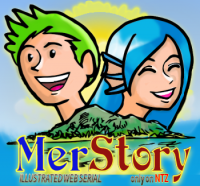 It means A Mer(Sea) Story or A Mermaid Story. The current 'page' is below. You can begin reading the story from here or clicking on the main picture above. Click on the Discussions or Main Index link to the left to access all posted segments. You could also really help out this author by making a small donation or purchase all of Book One as an ebook, in the Support box over at the right side of the screen. You might also support all my works on Patreon. Story now resumes at the Monday and Friday pace. Also, MerStory has been accepted and is now listed at The Webfiction Guide! Please let us know what you think. I'm doing a thing. Another weird thing. Click on the image above or here to see how it goes. So, I made a NTZ Exclusive Game Review of This War of Mine, a very socially-relevant indie game that lets you play it from the POV of those who really suffer most in war: the civilians. Would you like to leave a comment or criticism? Please let us know at the Main Discussion Thread here. You could also email me here or just leave a message on Patreon.